Brook Parker. Ali‘i Warriors. Giclee on canvas on view at the MAMo 2017 Awardee Gallery at ARTS at Marks Garage through July 5, 2017. 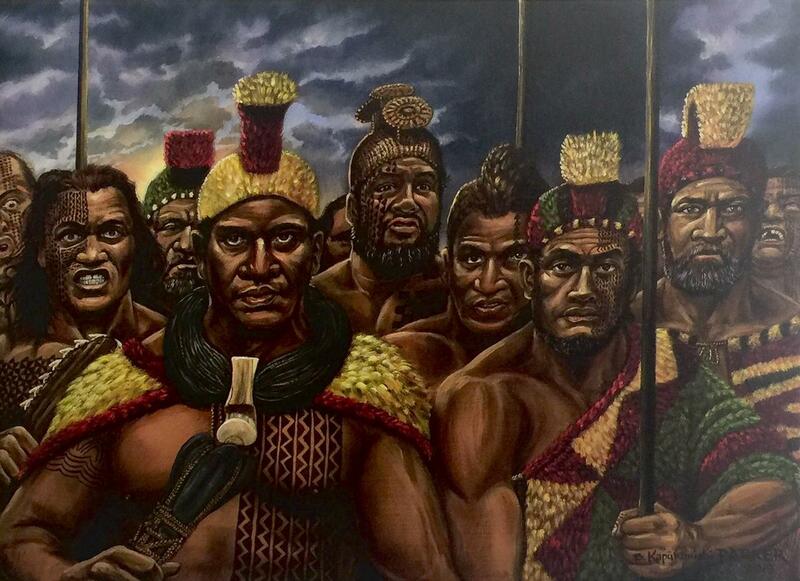 A quick conversation with Brook Parker about his paintings of Native Hawaiian history. Moana Eisele. Kapa. Wauke (mulberry) various natural dyes, acrylic paint. 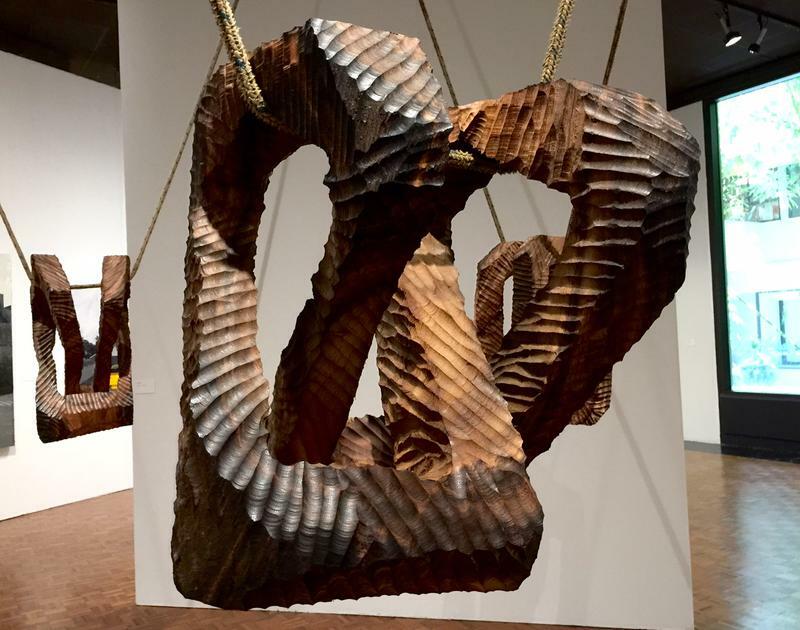 The MAMo Awardee Gallery at the Arts at Marks Garage offers contemporary Hawaiian kapa, with traditional weaponry and paintings of the pre-contact period through July 5th. 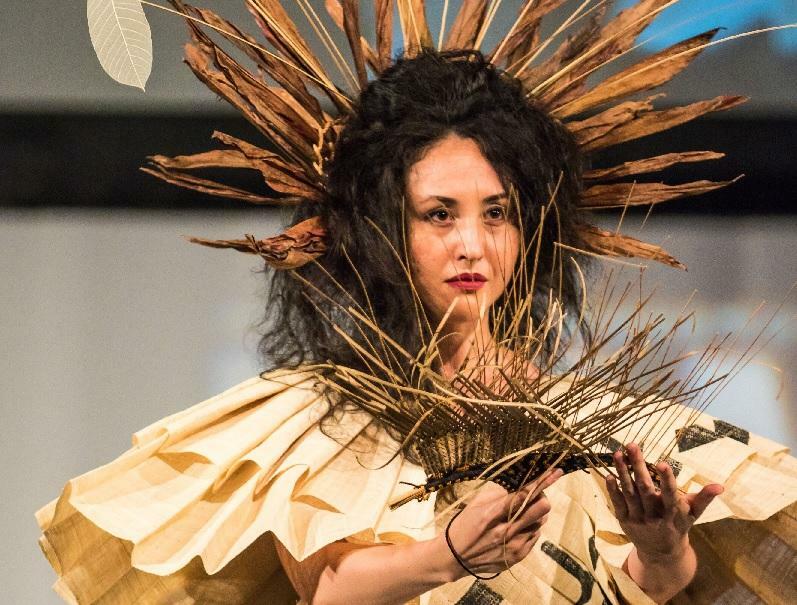 Awardees: Moana Eisley, Umi Kai, and Brook Parker were jurors for the Mamo Art Gallery at Kalia/Ala Moana Center currently featuring Native Hawaiian art and fashion. Awardees: Moana Eisley, Umi Kai, and Brook Parker. Brook Parker researches then paints significant moments from Hawai‘i’s past. Parker: I feel it a great blessing that I have the opportunity to take care my family doing something I love, and honoring my ancestors. Parker says his father was into painting, but he doesn’t remember painting together. Parker: Hawaiian style, you just be quiet and you watch. You observe. So that’s what I did and a favorite comic of mine was Conan, and that’s how I learned to draw anatomy. Artist Brook Parker drew his whole life and grew up watching his father paint. Parker finally picked up a brush in 2009, and the rest is history, literally. He plumbs the legends and family stories of old Hawai‘i, giving them images and renewed life. 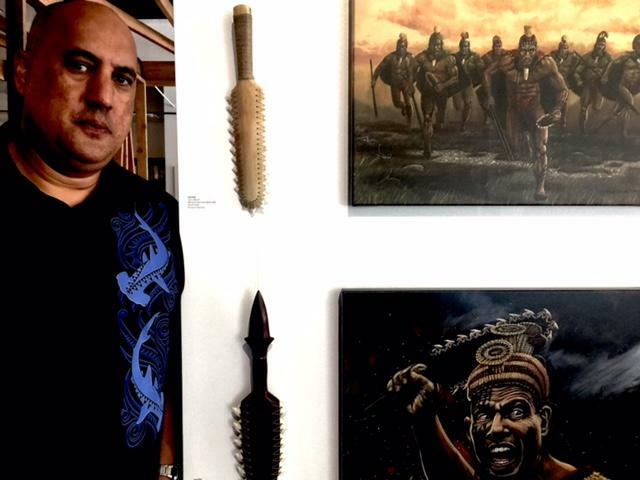 He is seen here with two of his paintings and implements created by Umi Kai. Parker’s depictions of historical events strike a chord with relatives of those appearing in his paintings and giclees . Recently, a woman asked for his painting of the king of Ka‘ū, a blind chief named Imaikalani. Parker: She said that’s her ancestor, she wants a print. So she bought the print. Then she emailed me, she said I gotta tell you something. I lost a picture of my great grandfather all these years, he was on Kaua‘i, his last name was Imaikalani. I just found his picture, this is from 1908. Side to side, the photo and the painting done a hundred years later---the resemblance is striking. Parker: I said, I take no credit, man, I’m getting help. I’m getting help. Many many many other times since that time, I’ll have ancestors come in and ask how do you know that’s how we look like? I said, I don’t know, brah, he just came out like that. (left) Moana Eisele. Kapa II. Wauke (mulberry) various natural dyes, acrylic paint. (center) Brook Parker. Ali‘i Warriors. Giclee on canvas. (above) Umi Kai. Neva Pahoa. Kauila. (right) Umi Kai. Pahi Kaua . A’u Kū (swordfish), twisted ‘aha (sennit). It’s a satisfying trio: Parker has painted men in feathers and kapa, each a personality, some carrying finely crafted weapons. 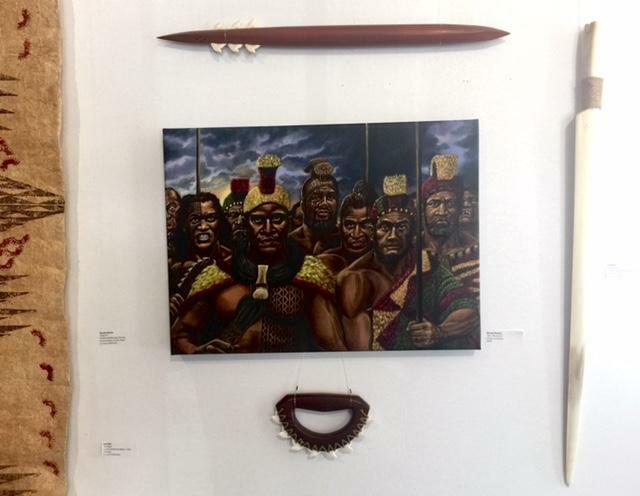 Also on view, kapa pieces by Moana Eisele and authentic recreations of Hawaiian tools and weaponry by Gordon Umi Kai.